So here are a few insects I noticed on my tomato today. I think they are mites. And I am seeing lady bug and lady bug larvae on that tomato. We know its a beneficial bug and eats aphids aplenty. After some more research, it seems to me that these won't be mites. Mites are very small, where as these are about 1 mm. They are brown, hard back. They seem to have a way to stick to the leaf, so when picking them, you can feel they are trying to hold on to the leaf. There are smaller ones on the underside and these bigger ones on the top side of the leaf. 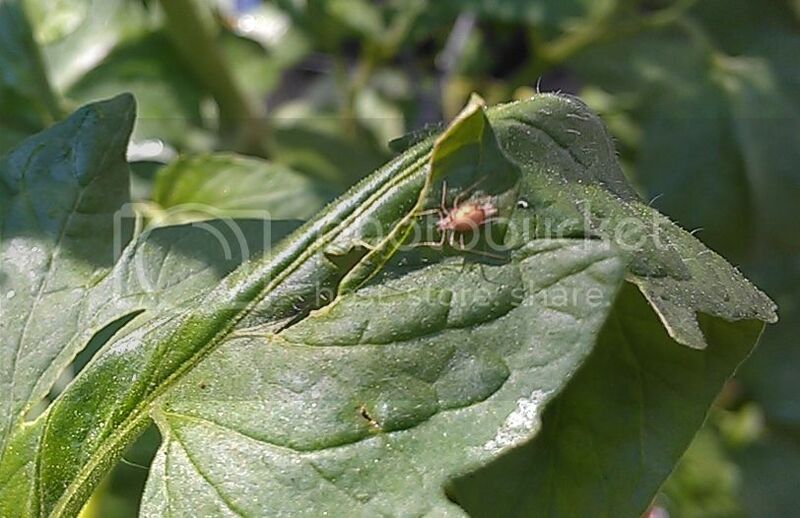 This gardenweb post seems to describe a similar insect/bug. However, I didn't see any conclusive post on that thread. Should I try neem oil? #1 son says it is a type of aphid and to blast it with water. 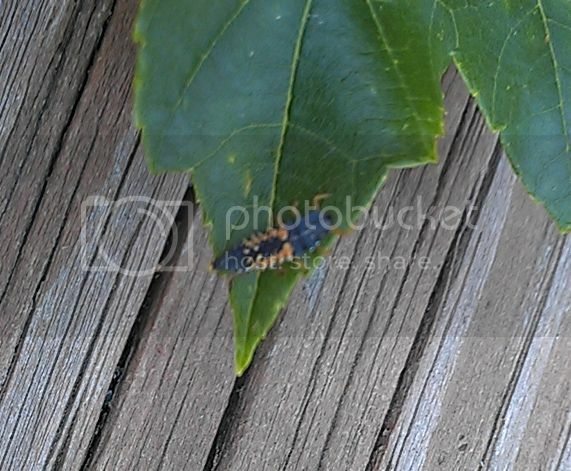 And yes, that is a ladybug larva...always good to see those visiting the garden. There are many. This is a university field guide. the beige bug in the first photo is a mummified aphid. Inside is a parasitic wasp larvae, which is a good bug. Leave them on the plant. After a few days you will see a hole on the top side which means the wasp has emerged. I don't agree with you on this one. Although, it would certainly be helpful to have something in the photo for scale. I gotta agree with solid7 on this one. Looks like a pretty healthy aphid to me, color isn't an indicator (I've seen red, green, and beige colonies at the same time on the same plant). Mummified ones usually look pretty ill and their legs go quickly. It is a mummified aphid. No, the legs are not too long. This mummified aphid is not moving b/c it is too crispy. No there should not be more of them. The parasitic wasp female lays one in a aphid colony and then moves to another aphid colony to lay another egg. Believe me, I know a parasitized aphid when I see one. Lol this aphid is NOT going anywhere. Why do you suppose it is on top of the leaf instead on the underside? Nattybo! Thank you! I have these crispy aphids on an badly infested/ant farmed plant. They were green before and now they are brown and hard. The question is, they are underside, why should they be on top? If your mummies are on the underside, there are several possible reasons for that. The reasons that I can think of (precoffee/breakfast) in order of probability: (1) The weather was inconducive for proper husk formation. (2) Adaptation to the ants. (3) The parasite did not move the host fast enough before the host brain stopped functioning. (4) A hyperparasite with different plans. (1)Here on the East coast we get days on end of glorious sunshine. The top side of the leaf is the optimal place to be in order for the exoskeleton of the aphid to dry. Dry is what is needed for the parasite to complete its metamorphosis. I have always lived on the East coast; my understanding of the Maritime North West (along with the British Isles and Tasmania) is that it is very rainy/foggy. Wet gray days...kind of like a perpetual spring over here. Thus, the underside of the leaf would be a better place to finish metamorphosis. (2)The ants. If an aphid cow acts odd and separates from the rest of the herd it will attract the ant overlords attention. So for self-preservation reasons, the parasitoid has learned to pupate amongst the rest of the herd on the underside of the leaf. So! For your gory entertainment imagine if you will that you yourself are the aphid and there is something in your abdomen that wiggles around every so often. You think its just gas and continue on your aphid ways inserting your stylets into a plant leaf and sucking out sugary water from the plant you are attached. Nothing seems amiss as you sway in the breeze surrounded by your sisters as your mother gives birth to yet another sibling. Then that wiggly feeling in your abdomen wiggles more. Perhaps your wing bugs are starting to grow! The thrill at the prospect of finally becoming an adult is shattered with a sharp pinch in your stomach. That is the wrong place for wing buds. More wiggling. Something is wrong, very wrong. Another pinch, this time closer to your head. Your central nervous system is being hijacked. Like a zombie you are no longer in control. Your limbs are flaying, your stylets have snapped. The thing inside you with its hooks sunk into your brain is moving you. Away from your mother and sisters. Its moving you to the top side of the leaf. Into the sun. In an odd way, you are thankful. Your misery will be over soon as the sun's rays dessicate your soft body. Disclaimer: The word *you* is used in a collective manner, not *you* in a personal/directive manner. No Aphids were harmed in the creation of this story. Any similarities to actual persons/aphids was coincidental. All rights reserved. Ha! Ok seen a couple today I never have before. First one was on tomato plant in the GH. Second is on a patty pan squash plan. Any help appreciated. After further research I found that the insect in the second picture is a brown lacewing larva. No luck on the first one yet.